Emory's annual Homecoming celebration, which includes scores of events and draws thousands of visitors from Atlanta and far beyond, has grown into one of the campus community’s most anticipated weeks of the year. This year's events are set for Sept. 24-27. • Corpus Cordis Aureum Golden Alumni Brunch: Miller-Ward Alumni House, 11 a.m. to 1 p.m. Emory alumni who graduated more than 50 years ago are invited to celebrate. $15 per person; registration required. • Partin Memorial Golf Tournament: Country Club of Gwinnett. Bus leaves Emory’s Chappell Park at 8 a.m., 9:30 a.m. shotgun start. $125 per person; registration required. • Homecoming Intramural 5K Walk/Run: Begins outside the Student Activity and Academic Center at 8 a.m.
• Homecoming Festival/Concert: Food and fun, music and games for all ages, on McDonough Field. Doors open at 2 p.m.; concert starts at 3:30 p.m.
For the latest homecoming information and to register for events, visit the Emory Alumni Association. 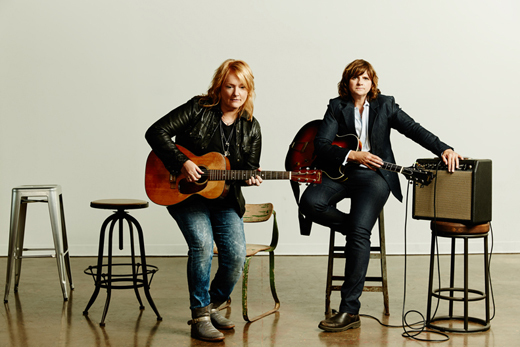 Grammy-winning folk-pop duo — and Emory alumnae — the Indigo Girls will headline the 2015 Emory Homecoming Weekend Concert, among a full slate of festivities planned for students and alumni Sept. 24-27. The free concert for the Emory community is scheduled for Saturday, Sept. 26, at 3:30 p.m. at McDonough Field, featuring a musical set that blends old favorites and new songs from their 16th studio album, “One Lost Day,” which was released this summer. No tickets are required to attend, but Emory students, alumni, faculty and staff are required to preregister. The award-winning duo — Emily Saliers 85C and Amy Ray 86C — met while attending grade school in Decatur and began singing together as “Saliers and Ray” while still in in high school, according to a biography on their website. They adopted the name “Indigo Girls” during their undergraduate years at Emory, where they attended classes by day and performed in area clubs and coffee houses by night. In fact, the pair was attending Emory in 1985 when they cut their first single, “Crazy Game/Everybody’s Waiting (For Someone to Come Home)." Since their respective graduations, the Indigo Girls have returned to campus several times to speak, sing and participate in a “creativity conversation.” Their last concert on campus was in September 2010, when they performed for Emory Homecoming, playing to a crowd of thousands on McDonough Field. Their 1989 debut album won a Grammy for Best Contemporary Folk Album. Today, the performers are recognized not only for their enduring musical careers, but also for their activism, which includes helping found Honor the Earth, an organization that defends Native American communities from environmental threats. During Emory’s 175th Anniversary Celebration in 2011, Saliers and Ray were recognized by the university as being among 175 Emory Makers of History. This year, Saliers will join fellow alums in celebrating her 30th class reunion. Her father, Don Saliers, serves the campus community as the William R. Cannon Distinguished Professor of Theology, Emeritus at Candler School of Theology.